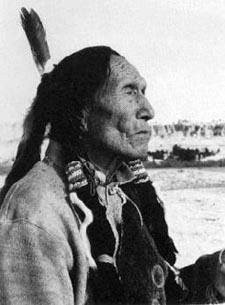 Black Elk was born a member of the Oglala Sioux peoples in 1863, and was closely related to Crazy Horse. In 1930, already an aged man, Black Elk spoke intimately with poet and critic John G. Neihardt, and recounted to him the tale of his vision of the Six Grandfathers and the reconstruction and vitalization of his people the Oglala Sioux. Neihardt, in turn, recorded those sessions in a text, and thus the body of Black Elk Speaks was born. The text tells a long narrative of Black Elk's vision for the unification of his people. The vision came to him during a time of great decimation and privation, when outsiders were robbing the Lakota of their land, food sources and their very way of life. Black Elk recounts in his memories as shared to Neihardt the fierce bravery of his people and how valiantly they fought for their freedom, winning a historical victory at Little Bighorn and suffering great decimation and loss at the Battle of Wounded Knee. The text itself, however, is more then just a retelling of history. It has been hailed by critics as a religious classic, and some consider it among one of the greatest spiritualist texts of the modern era. It is a stirring narrative of the memories of an aged healer who, as a young man before the reservation years, experienced a great vision, a vision to which he held fast for all of his days, in the hope that it's manifestation would arrive within his lifetime. It carries not only lessons of acceptance and perseverance, but also a central message of universal love and wonder. This is a book full of history and wisdom, and at the same time full of insight and hope. It is a recommended read for anyone interested in not only the Lakota nations, but the history of what it means to be a human being; of the glory and danger that comes with being a traveler through this world.